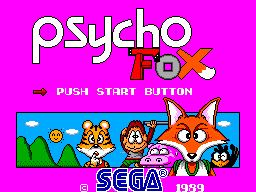 Psycho Fox was one of the early attempts by Sega to find a gaming franchise to rival its nemesis Nintendo and its flagship mascot, Mario. Yes Alex Kidd at the time was their own "mascot" but it did not have the same appeal despite the success of the first game in the series, Alex Kidd in Miracle World. 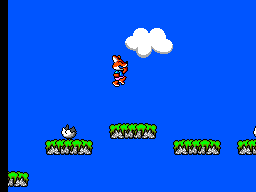 Other attempts were made like the popular Wonder Boy series before Sega brought out Psycho Fox. The story behind the game is that you (Psycho Fox) and your 3 friends (a Hippo, a Monkey and a Tiger) are off on a quest to foil the evil plans of Madfox Daimyojin who has infested the worlds with a multitude of enemies to stop you in your tracks. If you describe this as one of a kind action platforming, then you would be half right. 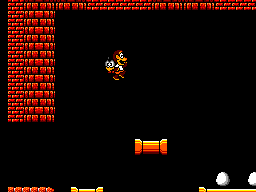 Yes the game features stockpiling of powerups and the ability to punch enemies and skim over water (if you get a good run up) but it does take sinspiration from the NES' title Super Mario 2 with a selection of 4 characters each with their own strengths and abilities. The only difference between this and Mario 2 is that here you can change characters at any time providing you have enough Transformation sticks collected unlike in mario 2 when you can only change characters at the beginning of a level. This can be invaluable when you are in a difficult spot and need a certain character to progress further. Another feature Psycho Fox inherits from the Mario series is the hidden warp zones which are found in cracks in the sky. These though can be deceptive if you access them in later levels as you do not know which level each pipe takes you to and could result in you going BACKWARDS in the game. For example the first pipe you see when you find Round 6-2's warp zone take you back to Round 3-1! There are 3 items which you can stockpile in the pause menu, the previously mentioned Transformation stick (or Shinto Stick), the Effigy (Which kills all enemies on the screen) and an Invincibility Pocean (which is self explanatory) all of these can be used at any time but you can only hold a maximum of 9 of each at any one time. When this was released in 1989, the graphics were jaw droppingly beautiful and surpassed anything the SMS's big rival the NES could produce at the time. And also considering the console was an 8-bit system, it makes it even more amazing that such a console can have the capability to produce such great graphics. The stages are all brilliantly designed and blend in well with their surroundings as are the characters who funnily enough match their attributes. To further demonstrate the SMS's graphical superioprity over the NES, Psycho Fox takes inspiration from an NES title called Kid Kool and when the 2 games are put side by side, Psycho Fox completely blows its NES rival out of sight. The only downside is constant flickering during bouns rounds and boss fights but that is down to the system not being able to handle so many moving sprites in a single screen. There are 3 tunes throughout the game (one of which repeats itself in 4 levels(, all of which are very catchy and you'll be humming to them while you play. It sets a cheerful mood for the game. Until you get to the Boss fights that is, and the music changes in such a way to put you in the mood for the fight ahead. I think the phrase "Easy to learn, difficult to master" comes to mind. The control scheme may be simple, the 1 button Punches or throws your Birdfly and the 2 button jumps. At first though you may think the controls are a tad unresponsive, but it decieves you in a way as mastering the controls is all about gaining momentum and how to judge it, the extremely slow beginning of a run takes some getting used to but that is all part of the challenge the game provides. Psycho Fox provides so many challenges that once you try it for the first time, you will be hooked. I have known people who have attempted to complete the game using the same character throughout (which can be done even with the Hippo) and there is a way you can complete the game in under 3 minutes. There is no score feature on this game although the amount of lives built up could count as that, speaking of which I have completed the game numerous times and the most lives I have finished with is 34. Overall this game is a forgotten gem which served as an inspiration for future SEGA titles, most notably the Mega Drive title Decap Attack which copied Psycho Fox's gameplay style. Infact This game may have served as a direct descendent to what would become Sonic The Hedgehog as the style of platforming and the overall feel of the game bears huge similarities to the legendary Mega Drive title. And for that we owe this game a huge debt of gratitude. It is a game that I would go as far as saying is one of the greatest games ever to grace the Master System with huge potential to go on and become a franchise in its own right, but alas the popularity of Alex Kidd at the time as well as Mario on the NES ensured this potentially great title was left in the wilderness.